"I was born into this art form." Sidi Mohamed "Joh" Camara grew up in Bamako, Mali where dance, music, and song are an integral part of everyday life. Birth, death, marriage, and initiations are all celebrated with specific dances and songs. Joh grew up surrounded by musicians, praise singers, and storytellers. He began his formal training with Mouvement Pionnier, and then went on to work with Troupe Sewa and Troupe Districte de Bamako before relocating to the United States in 1996. West African dances are in their purest traditional form in the villages, where a particular dance is unique to that village and the movements have remained unchanged for centuries. 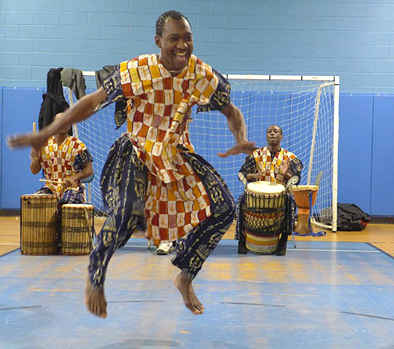 Though West African dance companies in urban centers keep the traditions alive, often the context and meaning in which these village dances originated gets lost. "Once they are performed by dance companies in the cities, they are taken out of context. . . , As a ballet, it is no longer a part of the ceremony it accompanies." Joh's research has taken him all over Mali to see the dances in their pure form in the ceremonies of which they are a part. He also is proficient on djun djun (bass, barrel drum) part and the djembe (hand drum). In addition to teaching, Camara takes part in ceremonies within the Malian and Guinean diaspora community both here and in New York. In 2018, the Mass Cultural Council awarded Camara an Artist Fellowship in the Traditional Arts.